The Automatic Translation card (T188247) allows to select between MT services. There is always one option that is used by default, and users can chose a different one to be the default. Currently the action to "Keep as default" is surfaced when the user selects an option that is not the default. However there is no indication of which is the current default, or visual confirmation that the change of default took place. Add a "default" label next to the default item in the drop-down options. Highlight the dropdown for a second when the "Keep as default" action takes effect. In this way, users can check and confirm which is the default service by looking at the list, and they will understand better than the default option changed. Meanwhile, users happy with the use of the default will get no additional signal. Pginer-WMF triaged this task as Normal priority. Pginer-WMF mentioned this in T188247: CX2: Automatic Translation card to adjust MT options. • Nikerabbit moved this task from Priority backlog to In Review on the Language-2018-Apr-June board. I also assume a sufficient fix would be to make the dropdown match the width of the input. Yes. this is a problem that we want to avoid. A follow-up patch for the current task is ok.
A separation to the left of the "default" label of at least 12px. In case of the main label still not fitting the available space, it can be cropped with ellipsis. The "default" label should use a 14px font. When it is not part of the active element, the "default" label will be in Base20 (#54595D) color. For the active element it is blue (#36C) instead. If it is hard to customize some of the styling aspects, we can skip the adjustments. I illustrated below the result of applying the styling adjustments, although making the menu wider would solve the issues for most cases. • Nikerabbit moved this task from In Review to In Progress on the Language-2018-Apr-June board. Petar.petkovic removed a subscriber: gerritbot. Latest patch should implement everything except ellipsis truncation. I tried flexbox but the flex-parent was outgrowing the parent widths (one of the parents is an a element styled as display: table) and I was not able to figure out how to stop that. If anyone feels up to the challenge, please take over for that part. Thanks for pointing to this @Esanders. It makes sense to consider this in the context of the process of component standardisation, so @Volker_E may want to take a look. We may want to consider whether (a) status indicators (such as "default" here) can become more prominent than more passive information (such as keyboard shortcuts) and (b) which grey to use for secondary content. I think the different alternatives could work well for this particular case, but I'd prefer checking with @Volker_E, and creating a follow-up ticket if changes are needed. Submitted a patch to do the truncation. Petar.petkovic moved this task from In Review to QA on the Language-2018-Apr-June board. • Vvjjkkii removed • Nikerabbit as the assignee of this task. • Vvjjkkii edited projects, added CheckUser, Connected-Open-Heritage-Batch-uploads (RAÄ-KMB_1_2017-02), Tamil-Sites, Gamepress, Hashtags, Jade, KartoEditor, New-Editor-Experiences, Mail, TCB-Team; removed MW-1.32-notes (WMF-deploy-2018-07-10 (1.32.0-wmf.12)). CommunityTechBot removed projects: TCB-Team, Mail, New-Editor-Experiences, KartoEditor, Jade, Hashtags, Gamepress, Tamil-Sites, Connected-Open-Heritage-Batch-uploads (RAÄ-KMB_1_2017-02), CheckUser. CommunityTechBot assigned this task to • Nikerabbit. 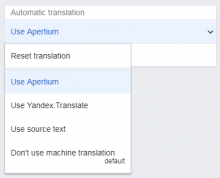 CommunityTechBot renamed this task from 2wbaaaaaaa to CX2: Better communicate the default status in the Automatic Translation card. 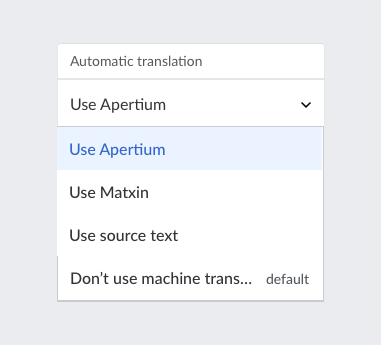 @Petar.petkovic - switching to "Don't use machine translation" option displays multiple Console error Uncaught TypeError: Cannot read property 'getModel' of undefined - the mouse pointer focus is lost in the paragraph and it's not possible to type there. 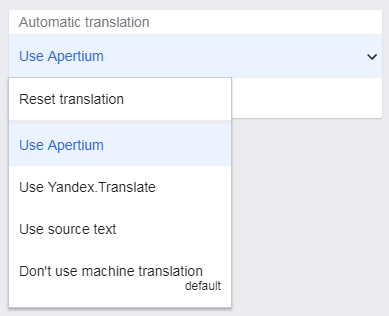 Also, it's not possible to switch to other machine translation options - Apertium or Yandex, so verifying how default can be changed cannot be currently done. I've seen this error and was trying to come up with steps to reproduce, but not successfully. Can you try different articles and report if there are clear steps? Since I wasn't able to switch MT options, I've cleared the local storage value for default MT option to make it work and haven't seen the error afterwards. 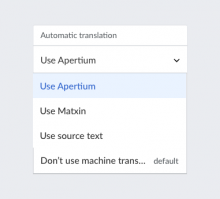 The default option for translation is persistent between user sessions and it's saved per translated article.